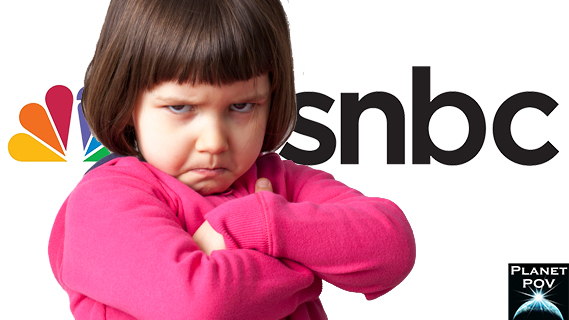 Seeking to increase their ratings share over their competitors, MSNBC has implemented a new programming strategy that relies on appealing to the toddler in all of us. Nicknamed, “The Peekaboo Initiative”, MSNBC has completed an extensive study on the behavior of young children to integrate with their programming in an innovative approach to achieve a more universal appeal. Why do we call this The Peekaboo Initiative? One thing that people have enjoyed since they were babies is surprise with the balance of expectation, as demonstrated by The Peekaboo Game. This is a primal entertainment and in pursuit of reaching out to a broader audience, MSNBC will be re-interpreting this game in its broadcast policies. For example, when Donald Trump and Hillary Clinton won the New York primaries by big margins just as they were widely expected to, the election night broadcast could have been boring and predictable. But…when we rhetorically hid our faces behind our hands and said, “Where are the winners? Who could they be?” and when the returns came in, pulled our hands away and said, “Peekaboo!!! What a surprise!!! What does this mean?? ?”…it made our viewers giggle with delight! Then our pundits all played in the “ball room”, throwing around balls in every silly way they could which entertained our viewers even more. We took the likely and predictable and turned it into a fun game that was “surprising” for our viewers. And what is our mission as a 24 hour news organization if not to keep our viewers entertained? As long as we maintain a constant state of surprise at even the most obvious events, our viewers can too. And many other “Peekaboo” moments will follow an initial one. Remember, act surprised when a pundit does a “Peekaboo”, no matter how contrived, redundant or contradictory it is of their previous Peekaboos, this is all about bringing wonder and enjoyment to our viewers of all ages. The average American reads at a 7th grade level but our studies conclude that they watch tv at a 1st grade level. So through this initiative, we’re seeking to connect with more viewers on the most basic level. Is it just another campaign speech regurgitating the same tired talking points? No, it’s “Breaking News”. Is it a stupid and ridiculous quote from a politician? No, it’s “Breaking News”. Is it something shallow or ultimately meaningless that happened on social media? No, it’s “Breaking News”! In keeping with appealing to the kid in all of us, we won’t be overloading our viewers with many different stories affecting people all around the country and the world. Peekaboo requires the KISS principle here, “Keep it Simple, Stupid!”. Is an election going on? Then the only news we broadcast is about the election. Did a celebrity die? Then three hours of news is three hours of a loop of video clips of that celebrity and discussions by hosts and their guests about how amazing that celebrity was (even if they weren’t fans). Don’t worry, our viewers will be so enthralled they won’t even wonder if anything else is going on in the entire world that they should know about. As was announced (as “Breaking News” of course), we have brought on 4 year old, Tiffany Flegman to be our Head of Programming, to assure the implementation of our Peekaboo Initiative. With her guidance, we anticipate our programming to be more accessible and entertaining to viewers of all ages. Her initial moves to personally do glamour makeovers on Chris Matthews and Lawrence O’Donnell including sparkles and wigs, having Chris Hayes use Barbie and Ken dolls to re-enact debates and having Rachel Maddow sit on the floor and read her stories from a pop-up book have already increased viewership over the last month. We’re looking forward to growing viewership under this new initiative that will bring out the toddler in this all of us and the network as a whole. Time to pull up our Huggies and be proud of the business we do in them! There are days when I’m so glad I got rid of cable, AdLib! And this reminds me of why. Thanks so much for a perfect analogy for what’s going on in the business of corporate-controlled news. About a week ago, armed gunmen killed 140 people in a massacre in Ethiopia. Even without cable, I was able to get the impression that this awful event was going almost entirely unreported. If this had happened in Rome or London, what would have been the reaction? Meanwhile the latest insult-swap between Lyin’ Ted and The Donald will be analyzed ad nauseam. It really does seem like the 4 year olds are running the show in cable news now. In fact, the average pre-school class probably has a better grasp on the concept of fairness than 90% of the management at CNN or MSNBC. And the use of the “Breaking News” crawl is so overdone that Kim Jong-un could drop a bomb on a nuclear power plant in Kansas and everyone would just yawn and go back to sleep at the sight of that “This Just In” banner rolling across the screen. “The Little Boy Who Cried Wolf Blitzer,” anyone? Kes, to keep a finger on the pulse of what’s going on around the MSM, I watch and read outlets that simply piss me off. Phil Griffin, the President at MSNBC, openly declared that because it brought the best ratings, the channel will cover almost exclusively, election “news”. And that isn’t really “news” they spend their day broadcasting, it’s almost all reporting polls and asking pundits, who are usually mouthpieces for one candidate or another, to predict this or that. Yep, the same pundits who claimed in the past that Trump wouldn’t ever run or was a passing thing and would fall away quickly. Literally, if you watched MSNBC all day, you would think the rest of the country and the rest of the world was temporarily transported to another dimension, that there is no news anywhere else than in the states that are having primaries. It’s disgusting. And you’re right about The Boy Who Cried Wolf (Blitzer…funny Kes!). If I ever see a “Breaking News” headline in the future, I sure won’t expect it to be anything important…and I’ll probably be right. We are confident that Tiffany will gain higher audience numbers by using the alternative ‘This Just In’ segments which will rehash 3 Hour old Breaking News, because our attention span will not go back that far. The old Goldfish Theory of News. PPO, and fortunately, toddlers are not known for their long term memory so presenting a day old story as “Breaking News” appears like Breaking News to them.